Corri’s “Working Knowledge” of horses has been obtained from growing up on a horse rehab facility. this is something you do not learn in a classroom. In addition Corri does have two equine degrees from Findley College, one of the Nations leading Equine colleges including Equine Business and Equine Studies degree. Equine Studies includes Reproduction, Preventitive Medicine, Equine Nutrition, Anatomy and Training. Corri won 1st place out of over 290 horse in Versatility at Wood County Fair, Ohio. With a horse that 3 years earlier had a fracture hip and was diagnosed with a then 90% fatal disease. To win Versatility Corri had to compete in Pleasure and Speed events with the same horse. The events included: Showmanship, Western Horsemanship, English Equitation, Reining, Barrels and Poles. Corri also owns two Dobermans Malcolm 5 yrs old and 80 lbs and Deuce is 2yrs old and 75 lbs. She credits their growth and health to Hilton Herbs Canine Products. Nancy has been a nurse for 35 years and manages an Intern Residency site for 2nd and 3rd year Medical Residents (Doctors). She is in charge of about 18 doctors and residents. 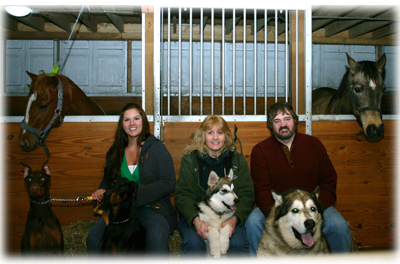 She focuses on Reiki, Healing Energy Work and many other alternative healing methods on both horse and human patients. Nancy has the uncanny ability of figuring out what is really wrong with a horse. Been referred to as a world class Horse Whisperer, able to get in there minds and work with horses that have been abused both physically and mentally. Getting them to form a trust or bond with a human. Not trusting humans because they have been treated poorly is usually the root of bad and aggressive behavior. We would love to hear from you, please feel free to contact The Healing Barn with any questions or comments you may have.